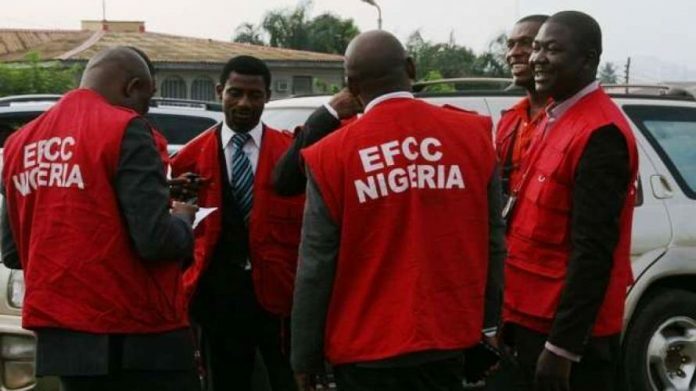 To avoid pillaging of resources and leaving behind huge debts and other expenses on incoming administrations in states where the baton will change hands, the Economic and Financial Crimes Commission, EFCC, has allegedly placed three serving governors who failed to return elected their anointed candidates in the just concluded governorships polls under its watch list. The governors currently on the watch list of the EFCC are: Rochas Okorocha of Imo state, Governor Ibinkule Amosun of Ogun state and his counterpart in Oyo state, Senator Ajimobi. A highly placed source at the Commission told us that the operatives of the Commission are working alongside commercial banks in other to thwart the alleged moves as well as to an end other financial crimes and money laundering. According to the source, Banks Chief executives particularly, branch managers of all the commercial banks in the 36 states including the Federal Capital Territory have already been briefed through the Central Bank of Nigeria, CBN. He said that the Chairman of the EFCC, Ibrahim Magu has already detailed a crack team of intelligence investigators from the Commission to monitor the outgoing governors as well as other state’s governors too over elections spending. He further explained that one of the reasons for this decision is geared towards avoiding a situation where incoming administrations are left with an empty treasury. Already, the Imo State chapter of the People’s Democratic Party has accused Governor Rochas Okorocha of withdrawing N17 bn from four banks in three days and converting government property to personal use. The state PDP Chairman, Mr. Charles Ezekwem, said this over the weekend in Owerri, the state capital, during a press conference. The PDP alleged that between Tuesday, March 12, 2019, and Thursday, March 14, 2019, Okorocha made withdrawals from Access Bank, Zenith Bank, Unity Bank and Skye Bank (Polaris ) amounting to over N17bn. The party said, “ In the last two days alone, Governor Okorocha and his cronies transferred ownership and re-registered more than 150 government vehicles to individuals. Government property including furniture and electronics in Government House, Owerri, are being moved out to Ogboko, Ideato South, the governor ’ s country home. “ About 300 uninstalled transformers have been moved to the governor ’ s home in Ogboko.” It further alleged that there was ongoing mass employment and backdating of employment with a view to creating problems for the incoming government.“ We are also aware of the rampant issuance of Certificates of Occupancy to family members and friends of the Okorocha family”, the party said. Similarly, Seyi Makinde, the governor-elect in Oyo state under the Platform of the leading opposition party, PDP, last week raised similar concern over the huge withdrawals of the Ajimobi led government after his preferred candidate was defeated at the governorship Polls. Next articleOgun APC warns Banks on Amosun’s Loan Request.